Avocados are an absolute treat, but it can be tricky finding ways to use them up once they reach that narrow window of ripeness. No one likes to throw away a beautiful avocado or delicious batch of guacamole simply because it has lost it's emerald green glow and turned brown. Use these easy tricks to keep your avocados and avocado products as appealing to the eye as they are to your taste buds. What Makes an Avocado Turn Brown? To prevent the browning, it's important to understand what causes it in the first place. Some fruits and vegetables (apples, potatoes, avocados, and more) contain phenolic compounds and enzymes that, when exposed to oxygen, will produce a brown-black pigment. The cell surface usually acts as a barrier between these compounds and oxygen, but when the product is cut or bruised this barrier is broken, the compounds are oxygenated, and a color producing chemical reaction occurs. Not all products contain these compounds, and therefore not all produce will turn dark when cutting open. Since oxygen is the catalyst for this reaction, it makes sense that preventing oxygen exposure would prevent the browning. There are several methods for preventing oxygen exposure or simply preventing the oxygenating reaction. Citric acid in lemon and lime juice is a strong antioxidant that will dramatically slow the browning process. Simply squeezing a small amount of fresh citrus juice over your avocado or guacamole will keep the avocado from browning for at least a day. Many guacamole recipes include a small amount of lime juice, which will also help slow browning once mixed in. Oil is an excellent barrier to oxygen. Brushing a thin layer of oil (olive or vegetable) onto the surface of a cut avocado will prevent browning. While this method is great for whole fruit, it isn't ideal for guacamole since the surface is uneven and difficult to brush. Plastic wrap is often used in food preparation and storage to prevent oxygen exposure. To protect an avocado that has been cut open, simply wrap the avocado as tightly as possible, making sure the exposed surface comes into full contact with the plastic, leaving no air gaps. For guacamole, plastic wrap can be pressed down onto the surface of the dip instead of stretched out over the top of the bowl. Plastic wrap also helps prevent moisture loss during refrigeration, which can leave avocados tough or rubbery in texture. If you have extra red onion, it can be used to keep your avocado or guacamole from browning. Simply cut the onion into large chunks and place it in the same container or sprinkled over your guacamole during storage. The gasses released from the red onion (the same gasses that make your eyes burn) prevent oxidation. As long as you make sure the red onion only contacts the skin of the avocado, there should be no noticeable flavor from storing the avocado alongside the onion. Some say that leaving the pit in an avocado or even pressing a pit into a bowl of guacamole will also delay the browning process. 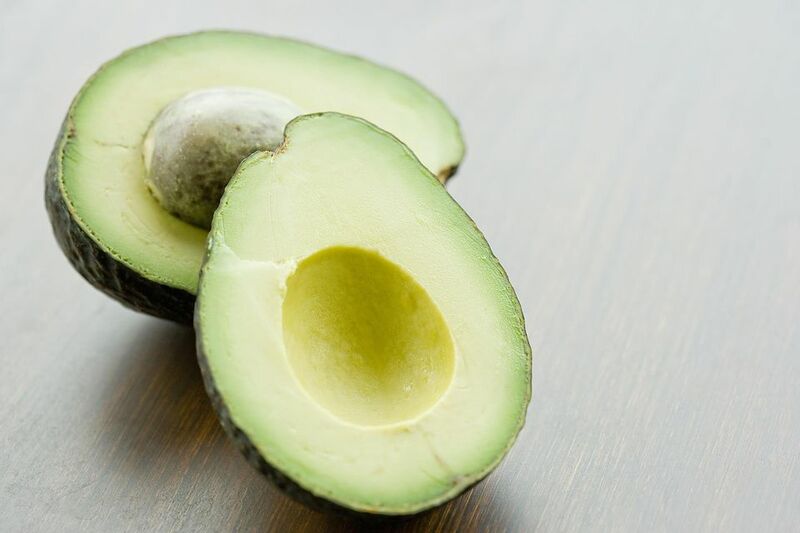 Regardless of the method used to prevent browning, always store the avocado in an air-tight container to prevent the avocado from drying out or absorbing rogue flavors.